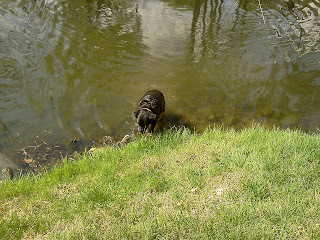 Lady took a visit to Dana Browns island yesterday hunting for a goose nest. None to be found yesterday but a new nest was formed today that she will visit early this next week. She was successful in locating another nest in the wooded area. Ladies running days are pretty much over but she is still a great hunter and does a good job in keeping the baby geese population at or very near 0. We love our wildlife but geese born on property become a permanent resident to our property. Great spring morning and season so far!! 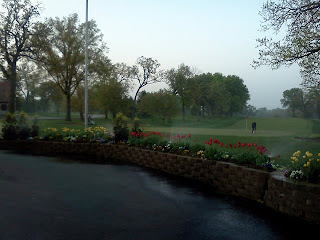 Becky has added some additional spring blooming plants to the flag pole area beds. Staff is out this morning cleaning and setting course for what should be a beautiful day! Come out and see us. Just spent a few minutes watching the Decorah Eagles. Two eaglets have hatched and a third is on its way. Also some additional coverage from a station in Milwaukee below. FYI, that is not a eaglet laid out in front of the parent. I believe that is some type of prey. Saw the parent feeding the eaglets some fish just a couple of minutes ago. Cool stuff for an outdoor freak!!!!! 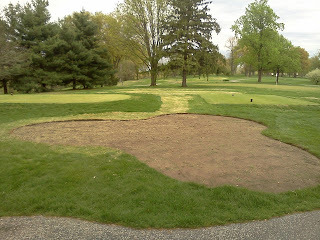 Since we changed the design of #13 tees last season, the ornamental bed and walk path do not fit with the new tee design. Today, the staff stripped off the sod in a different location based on Becky's recommendation. 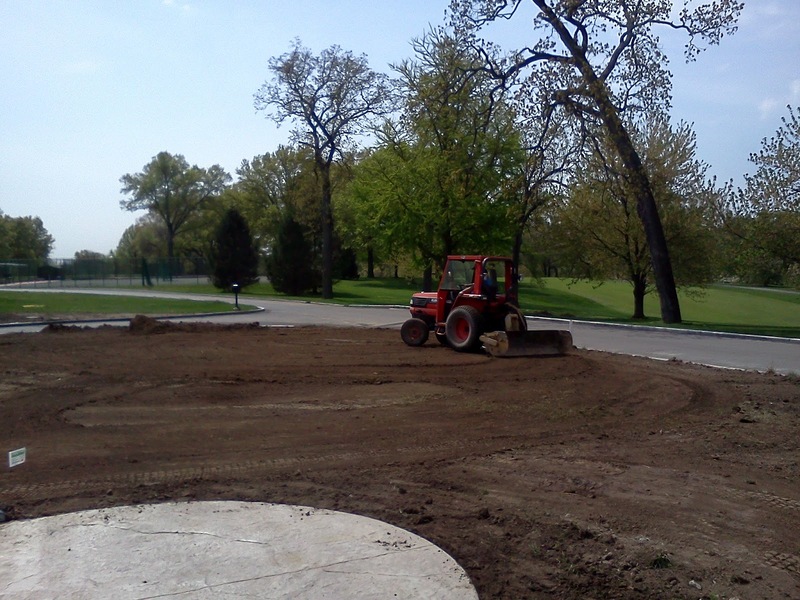 We will be establishing a new bed between the new white/blue teeing ground in the next week or two. 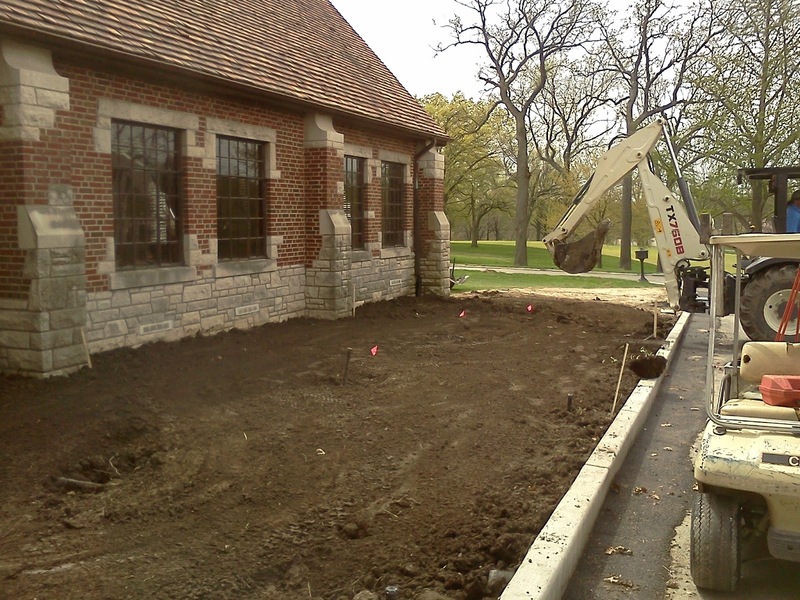 The old bed will be removed and the area will be placed back to turf. If you look close enough, I think you might see Mickey Mouse in that design! 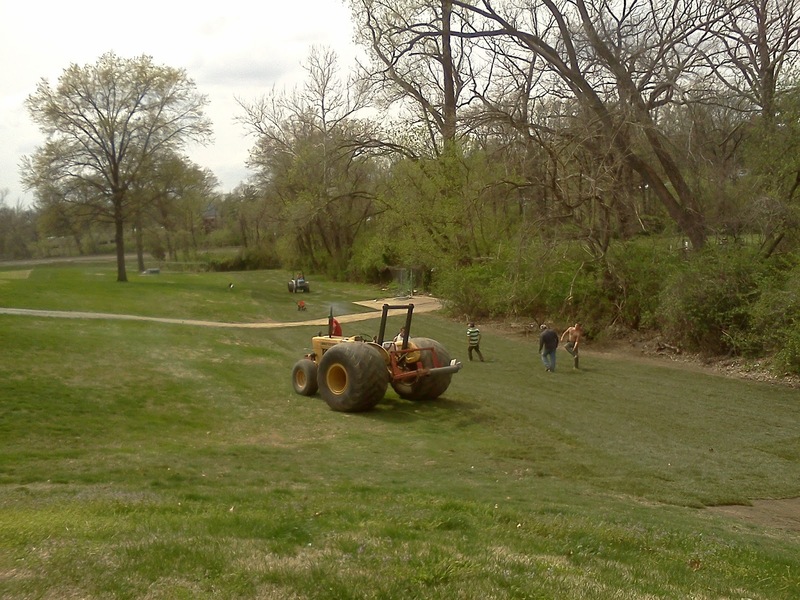 The first mowing of the fescue along #1 fairway took place this morning. We used a push mower to mow the area between the new fairway and the fence which has now been installed completely. There is a hole in the fence on the green end so that we do some maintenance on the new fescue on the other side of the fence. There is no access to the sod except over the fence which is not practical. 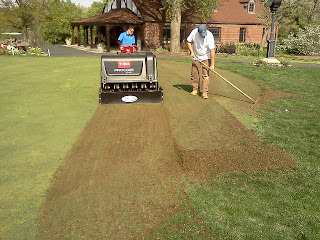 It is important to us that the turf get established completely so it can survive the summer heat and stress. We will not place a large area mower on the area until the turf has fully established and the soil can handle the large mower. 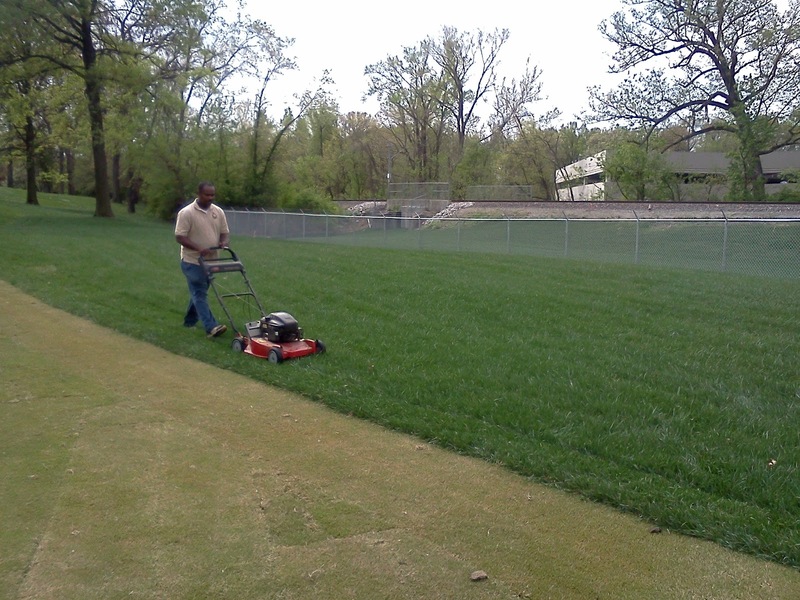 Randy Brown doing the honors of placing the first mowing on the new fescue rough. The new fence in the background. Employees from Alberici Construction drilling holes through the concrete to insert the new handrails. 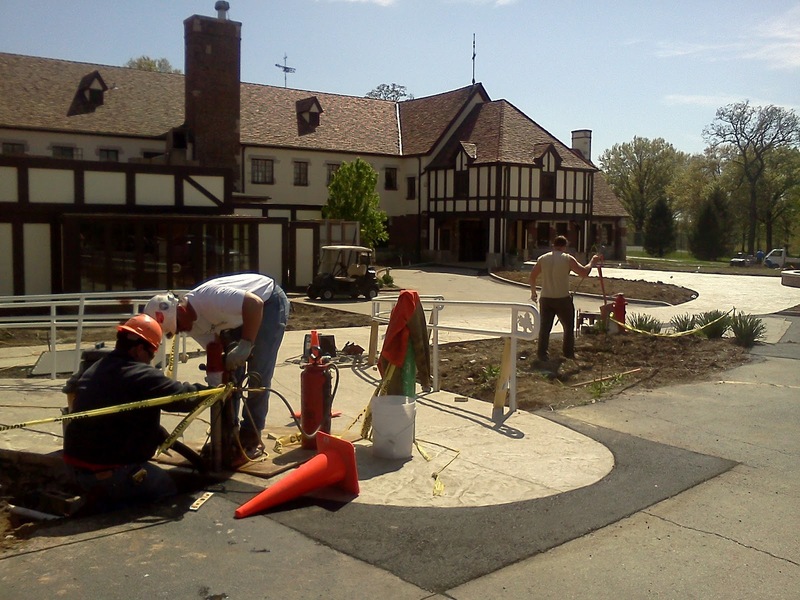 In the background, personnel from Green Turf installing the lighting that is a part of the project. Skip moving some dirt today in the front lawn. 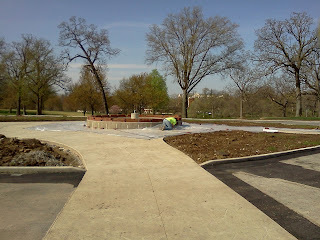 We did a lot of hand raking along the curbs and plaza area in getting the proper grade set. 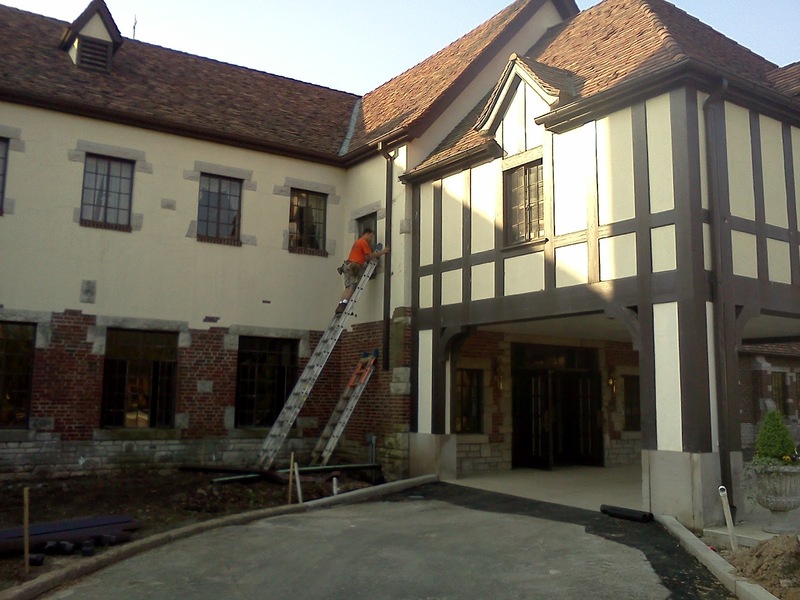 Not a part of the project but work that needed to take place before the completion of the project, we contracted with Scott-Lee Guttering to install new down spouts on the front of the building. 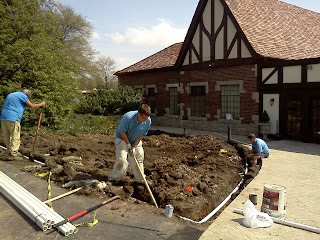 Installing a new landscape plan required down spouts that would send water into our drainage system instead of around the base of the building. Our staff extending the landscape wall at the old steps. The wall will rise to the level of the parking lot and will stair step down and the grade level toward the light pole becomes shorter. 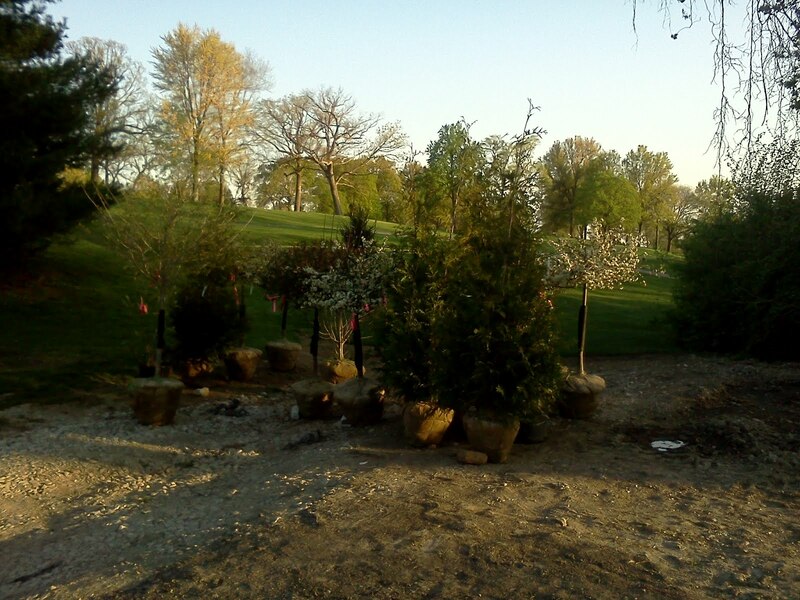 Trees arriving for clubhouse and Pierson Memorial planting beds. Becky has ordered in over 20 trees and another 40 shrubs for the main entrance plantings that the club is doing along with casual entrance Pierson Memorial planting beds. 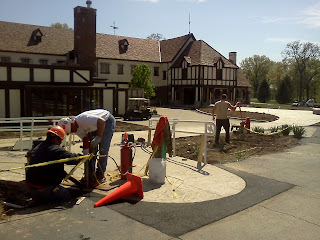 The lighting contractor has installed the uplightong for the clubhouse and the plaza area lighting. 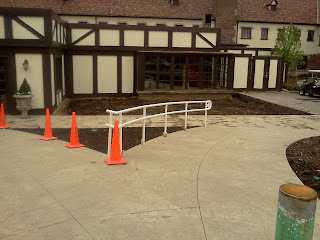 Handrails are being set in place and the lighting contractor has to run the wiring and install the lights on the rails. I expect the lights to be operational sometime next week. Planting bed work, lawn irrigation and lawn grading will be our priorities over the next 10 days as we juggle May like golf course conditions with the project work. Deep channel filled with sand assisting in moving water down through the profile allowing the greens to drain quicker. Gas exchange between CO2 that builds up in the soil and O2 that becomes depleted in the soil/root system. 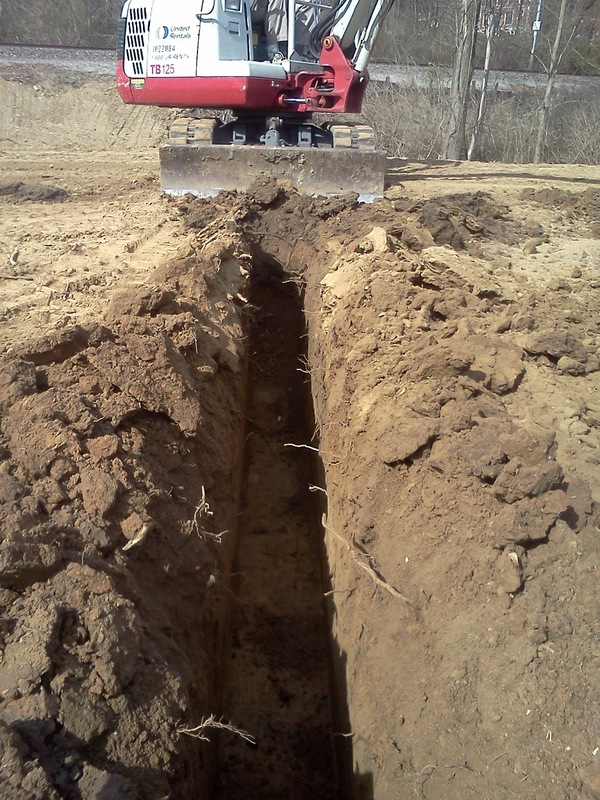 The deep channel also provides a healthy environment for improved root growth because of water penetration and O2 exchange which roots need to be healthy. Improved drainage. Our greens have no drainage. 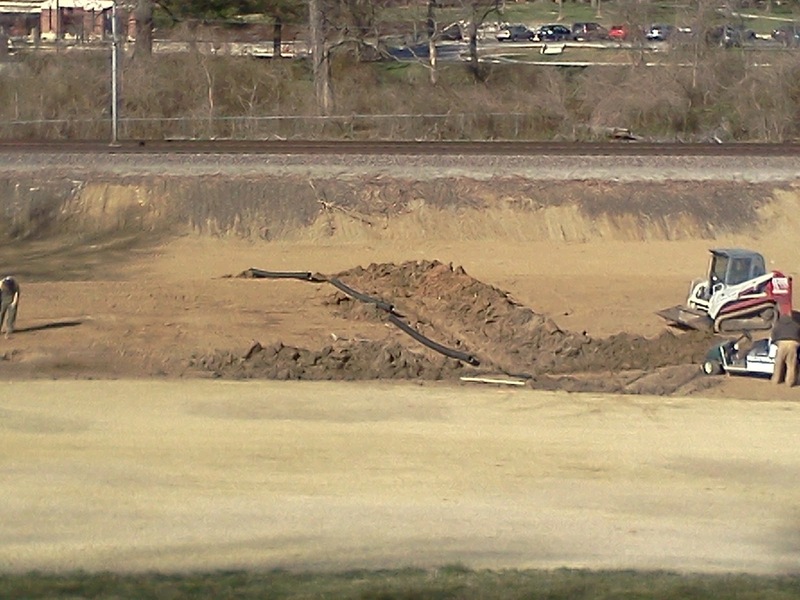 Below our 3-4" sand layer is the existing layer of soil in which our greens were constructed over 100 years ago. Water drains through the sand layer and then slowly moves through the soil layer or it moves laterally slowing based on the slope of the old construction. Helps remove some of the mat layer in the top inch of the green profile. Also referred to by some as the thatch layer. Plants regenerate new leaves out the side of the existing hole so the hole can become filled in. 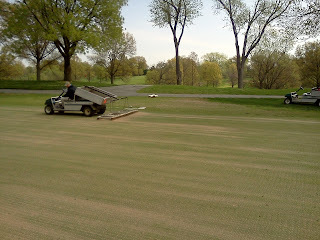 Exchanges so of the very fine sand that our greens were top dressed with over the years to a sand that is more coarse. 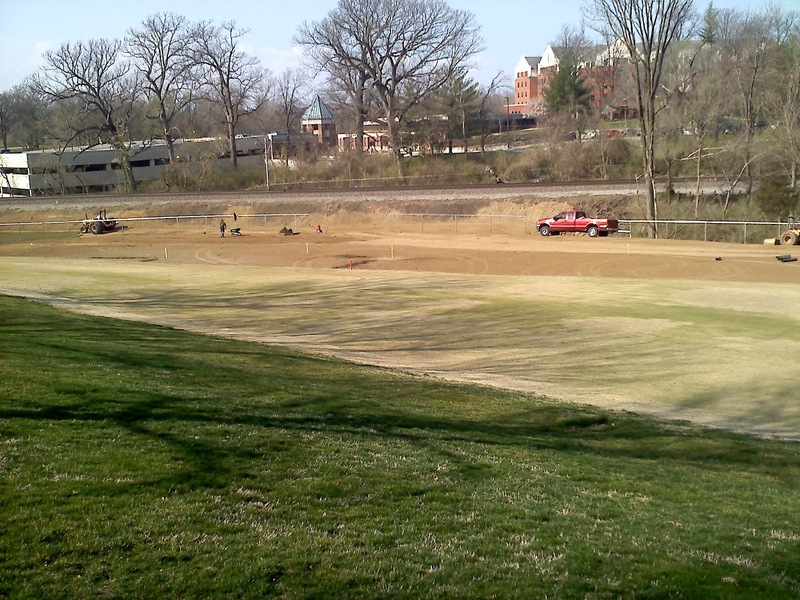 St. Louis area superintendents choice for topdressing sand over the last 20 years was a fine sand that has now created issues in the top few inches of topdressing layer. 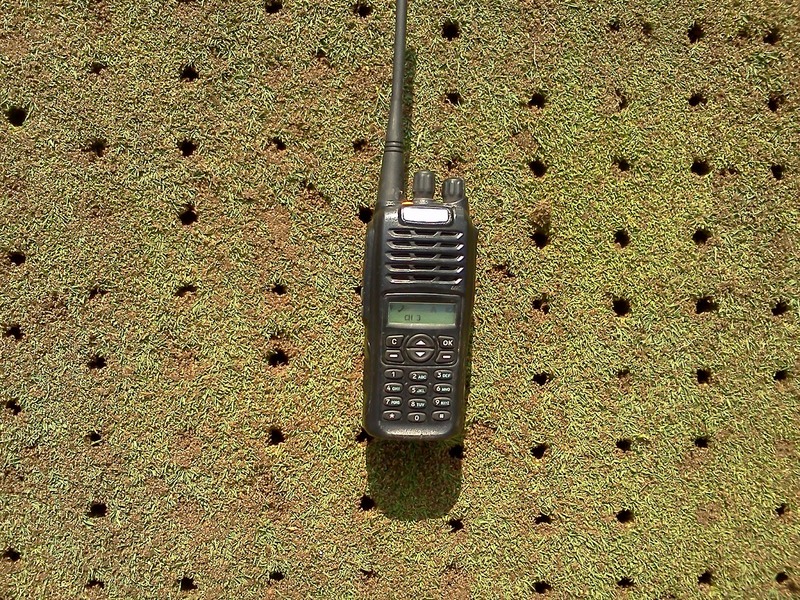 The sand holds too much moisture reducing rooting potential and leading to less than healthy greens. 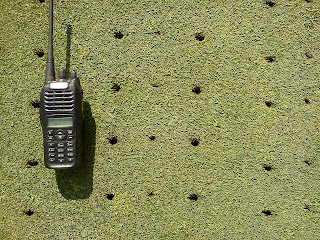 The close spacing of the aeration holes also improves oxygen exchange just like the deep tining process. The heavy sand topdressing helped fill the holes with sand which improves ball roll. It also gives the roots a safe environment to move into. Picking up the piles of cores with shovels. We placed one bag of a soil amendment product on the surface which is full of micro nutrients. Sand is then placed on the greens at about 2-2.5 tons of sand per green. 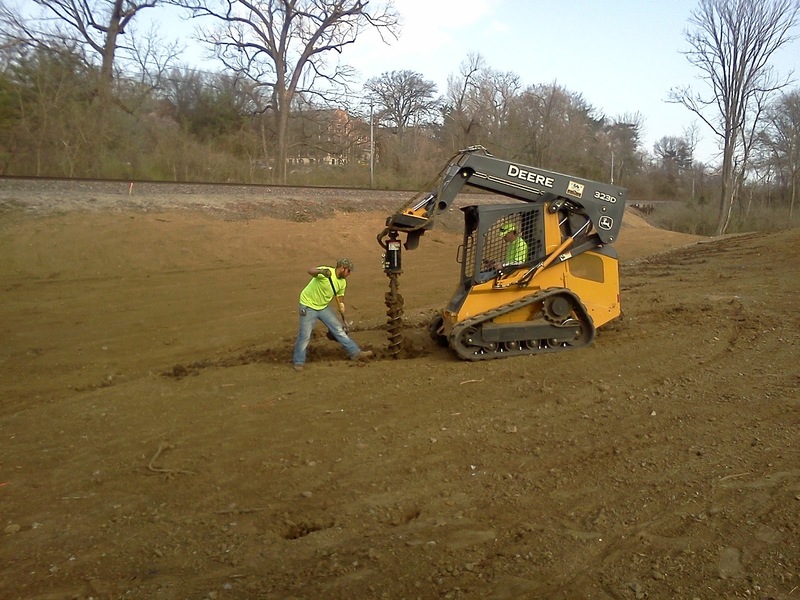 About 45-50 tons of sand was used for the complete process. 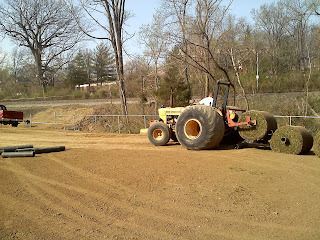 We use a pull behind blower to blow sand into the holes. The old way was to go around in circles a dizzying number of times with a brush until all the sands were filled with sand. 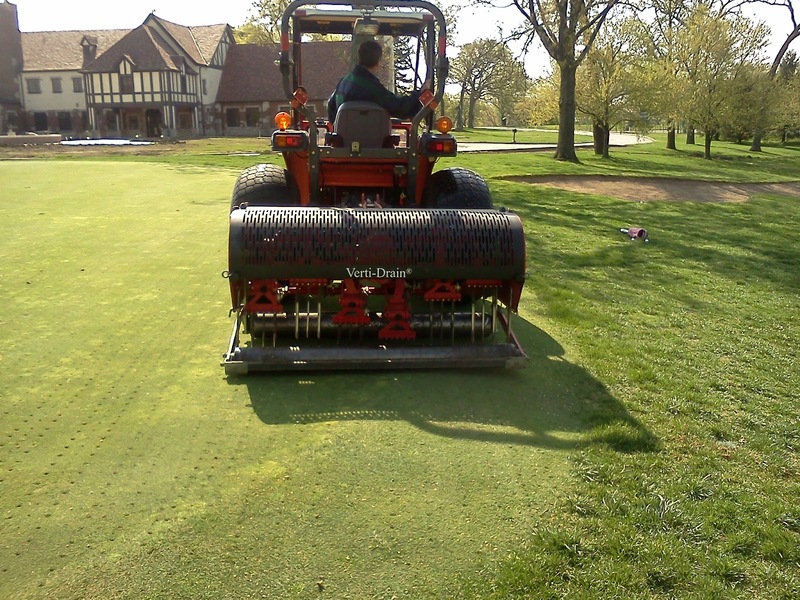 Brush the greens with a drag brush behind a cart to smooth the sand and help distribute it across the profile. Roll the greens with our rolling greens mower. Apply a fertilizer and then water the greens. 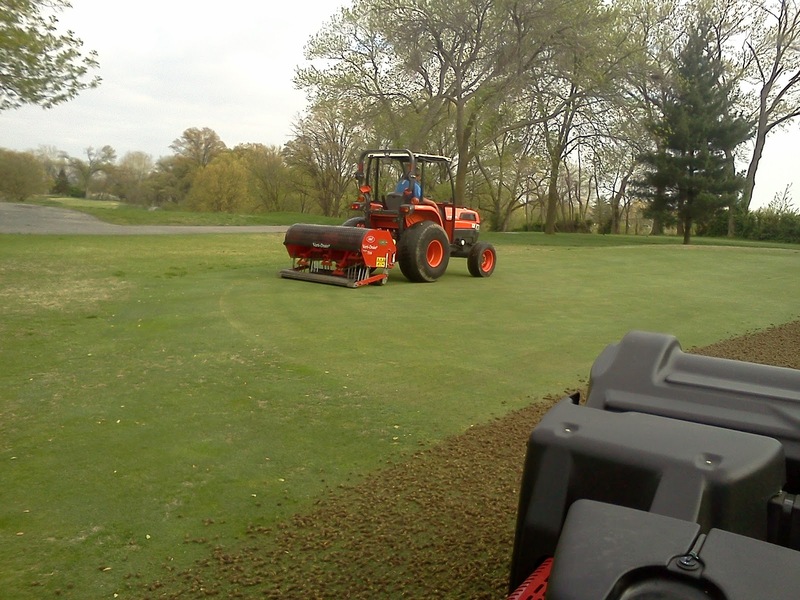 Skip using the deep tining machine with the tractor and I'm using the walking aerator pulling the core on Sunday evening. Tom using the walking aerator with the plug box on the back. The first 8 greens were used without which meant the staff had to blow the plugs into two row and then pick up the plugs. We borrowed the box from Spencer T to speed up our process and save on the guys backs. 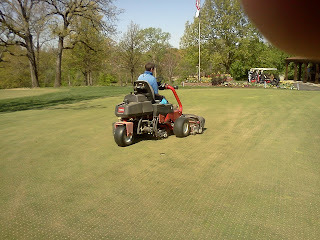 The close spacing at 2" centers of the walking aerator. 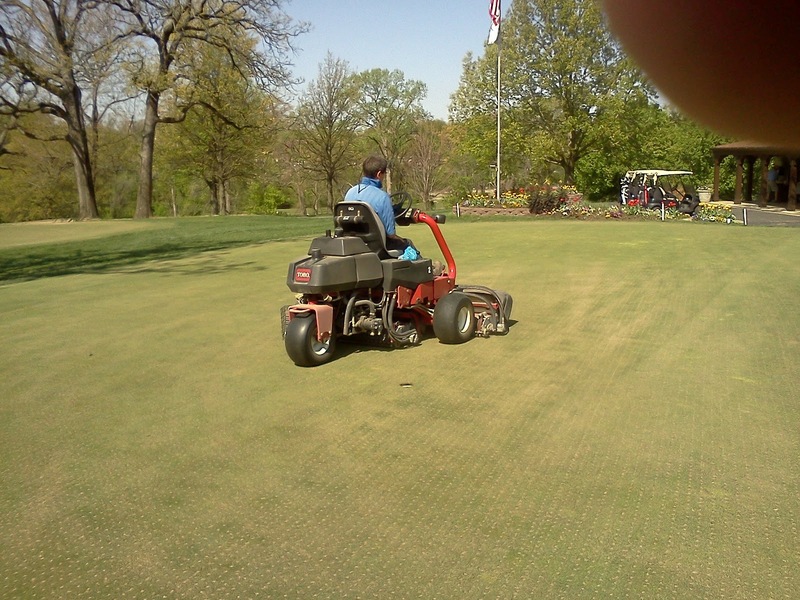 Russ on the deep tining machine. 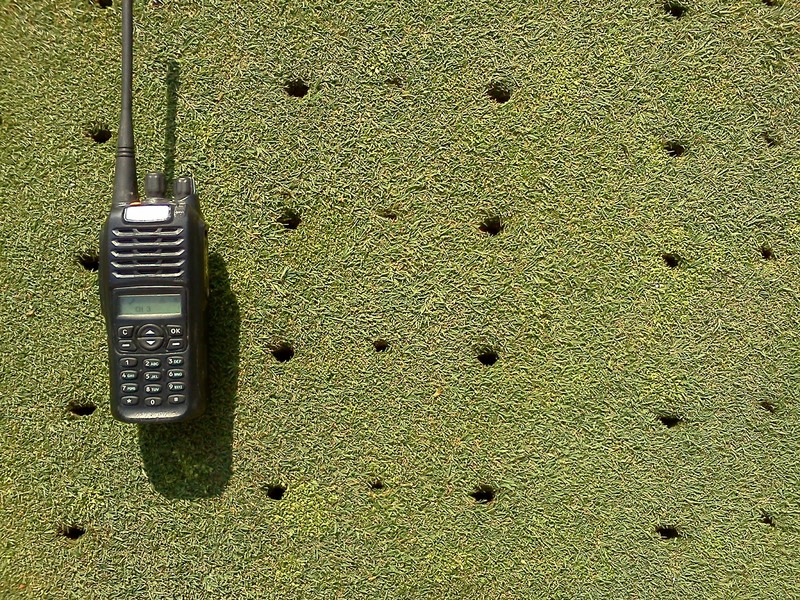 Larger holes but not as close spacing as the walking machine. Harry moving the piles out of the way. Jason dragging the green with the brush after the sand was blown back and forth and into the holes. We did a dry mow today on the greens that were completed on Monday. Greens 11-12, 14-18 will be brushed again tomorrow and will be mowed like the PG, 1-10 and 13 were completed today.
. More detailed report over the next couple of days. The remaining sod was installed on Wednesday on the right side of #1. 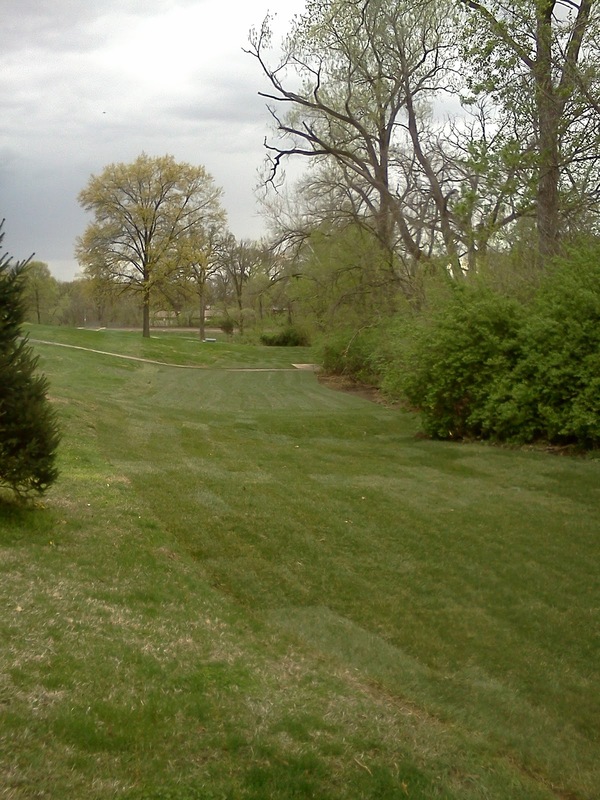 The remaining zoysia fairway spot was covered as was the rest of the road up to our maintenance building lot. 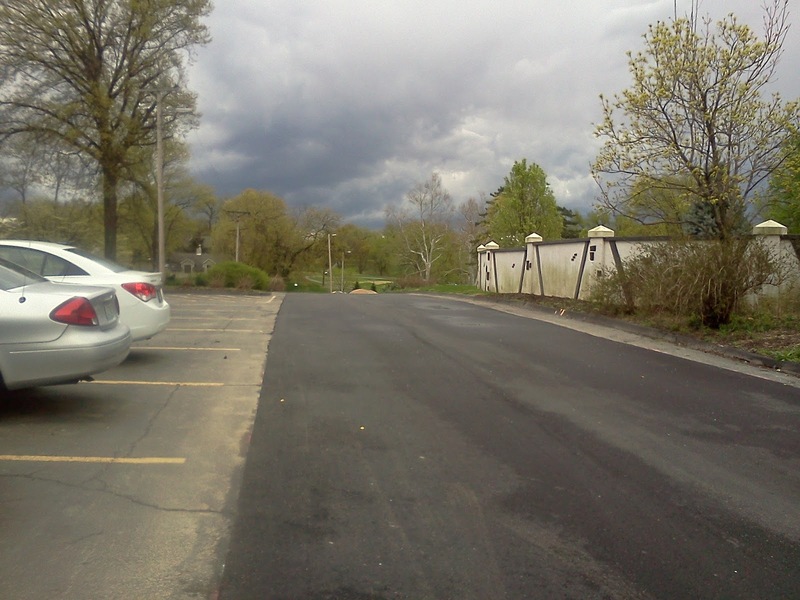 The asphalt near the employee parking area to the back gate was replaced. The only thing left to complete for this project is the wire mesh for the fence along #1 which is to be accomplished on Tuesday. 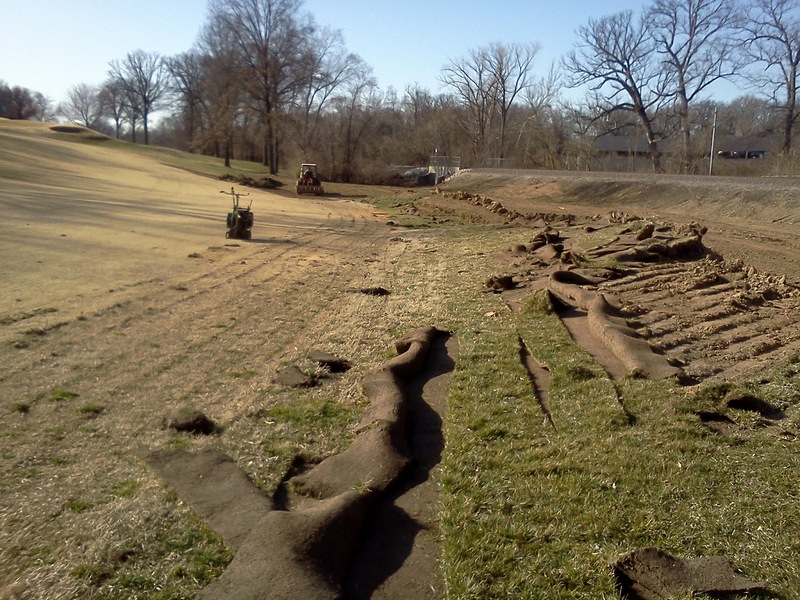 Missouri Turf installing new fescue sod for old construction roadway near #1 tee. The finished product. Looks great! 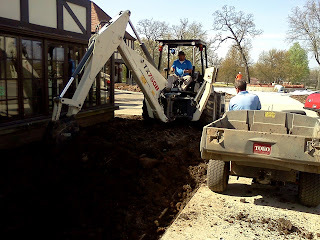 Soil was moved around the living room and main dining room ornamental planting beds this week in preparation for our lighting contractor to install the walkway and building up lighting next week. Once the lighting is installed, we will begin preparations for tilling the ornamental beds and incorporating copious amounts of compost in them to improve the soil. The staff was busy installing the changes to the ornamental bed irrigation system for the casual entrance beds. What grass is remaining on the front lawn was sprayed with non-selective herbicide as well as selective herbicides in an effort to kill the remaining grass and weaken the bermuda grass as much as possible. 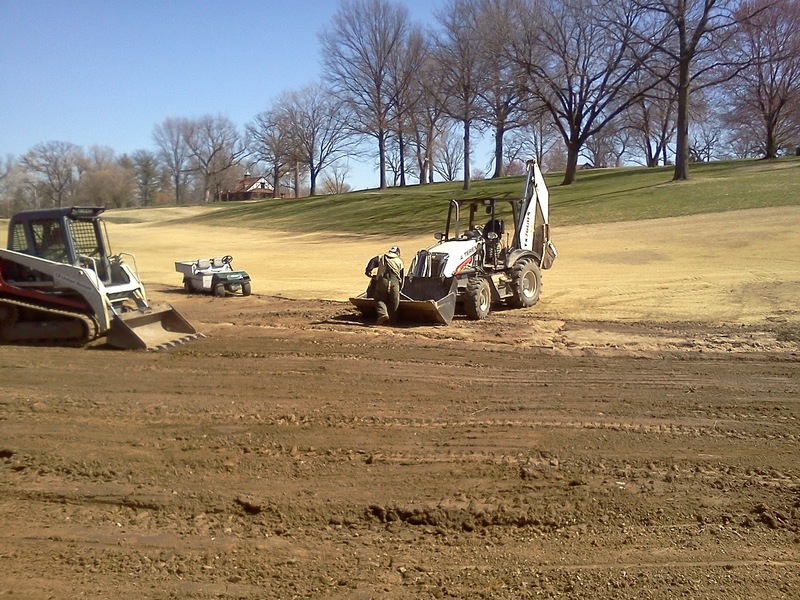 The dead material will be stripped off, the area and will then be finished graded and sodded. I hope the lawn work will be completed by April 6th. Some of the plant material is beginning to arrive. 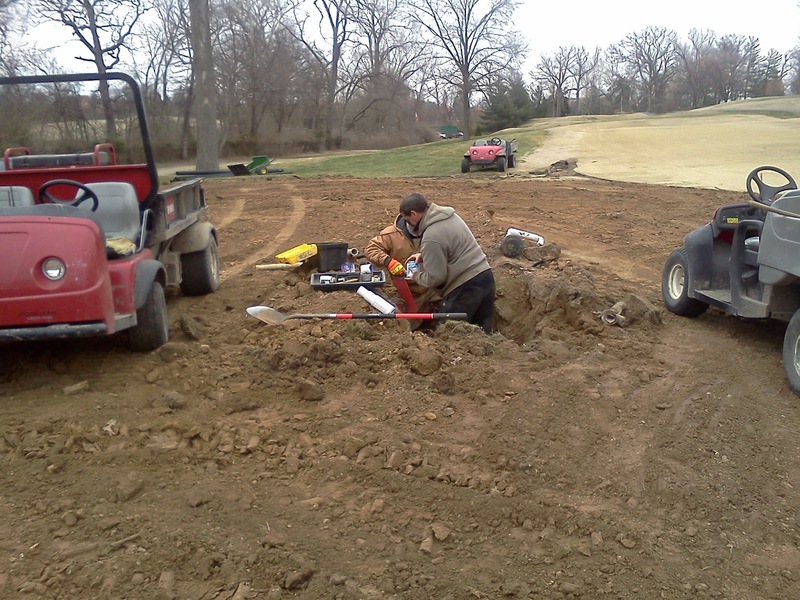 I hope to have the plantings completed during the week of April 9th as we try to manage our golf course work with our project work. 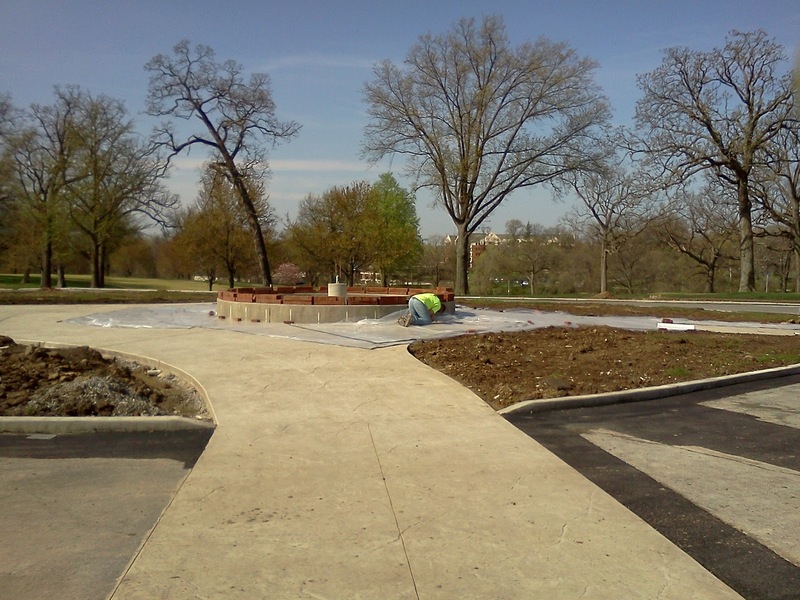 A large number perennials will be going into the casual entrance beds and are not expected here for delivery until around the 3rd week of April. 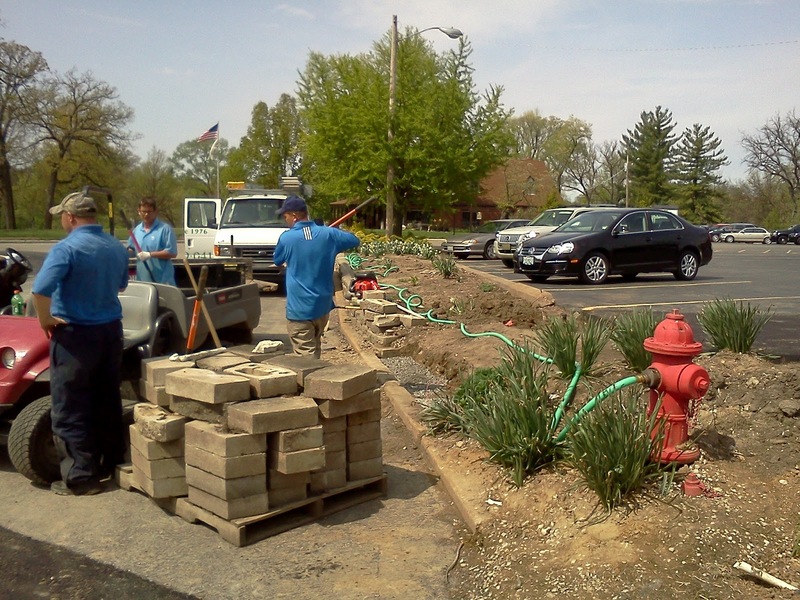 We will get those beds ready, will do a light mulching to improve their look and have them ready for Becky to plant when the plants arrive. 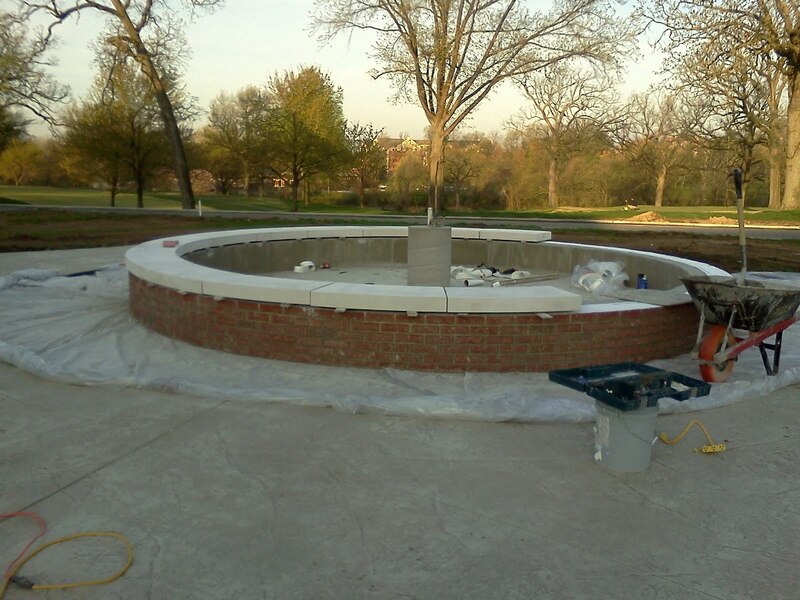 The brick facade and cap was placed on the fountain pool area during the middle of the week. The handrails are being installed over the next few days for the casual entrance area. The handrails will be painted black. Currently they have a white primer on them. Additional electrical work took place this week as well. 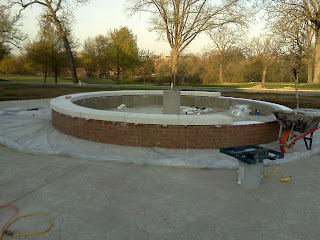 The handrails and pool bottom are scheduled to be painted on Monday, April 1st. 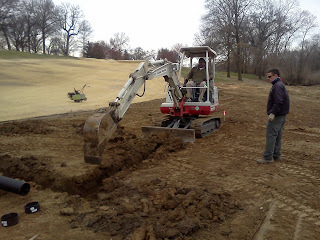 April 21st which is the day of our Glen Echo Forever Bunker Restoration Event. 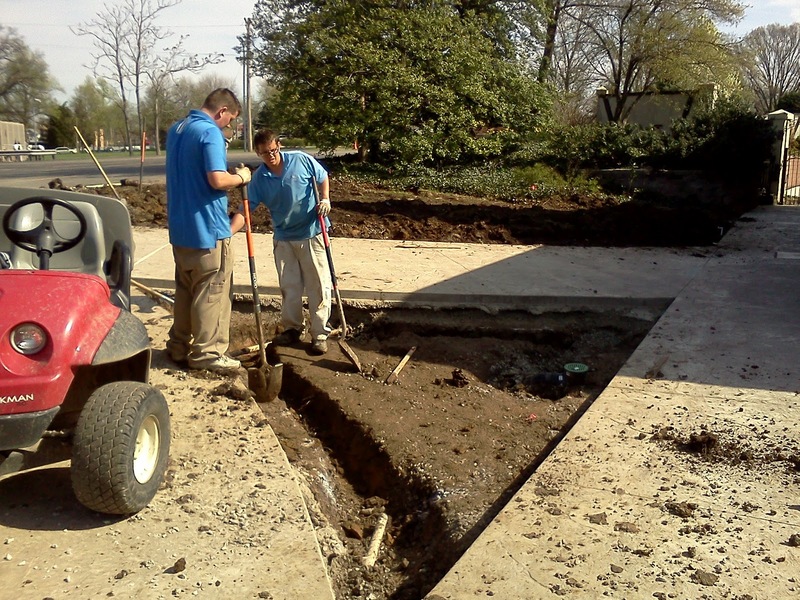 Jeff and Joe hand digging the triangle ornamental bed near the casual entrance in preparation for the new irrigation pipe. Staff doing the same in the area where the steps were located near the casual entrance. 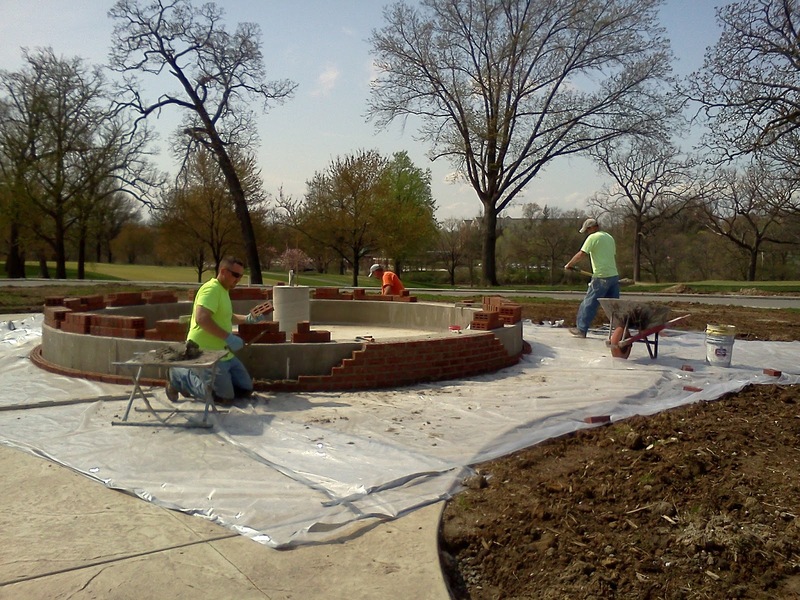 Employees from Heitkamp Masonry placing plastic down to protect our new stamped concrete. The brick being laid for the facade on the fountain pool. The finished product with the new limestone cap on top. Skip helping move some extra dirt that was back filled along the living room outside wall. 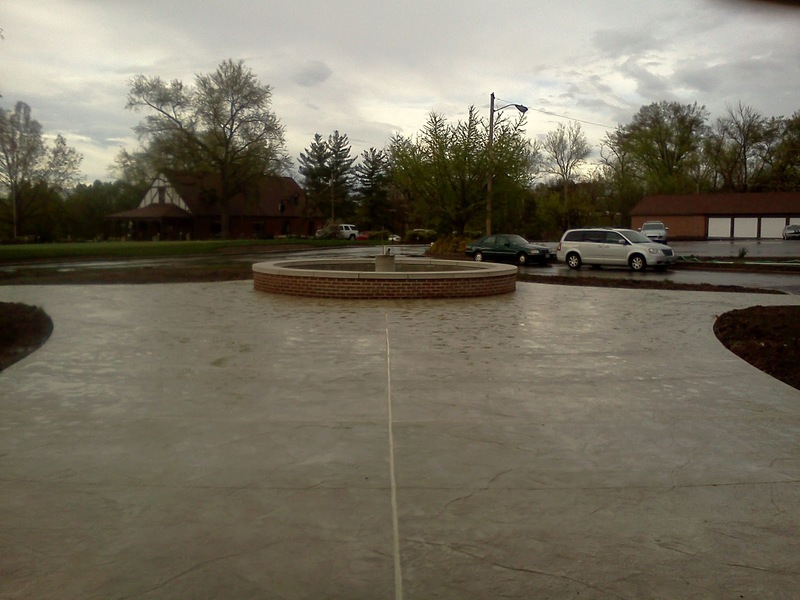 We added nearly 10 inches to just under 4" in some areas to help the water move away from the building and out into the bed. 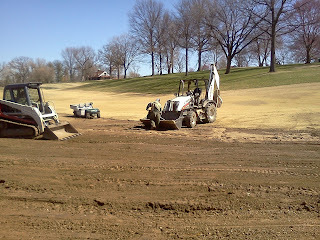 Skip removing about 6" of zoysia roots and mass from the Olympic room area. 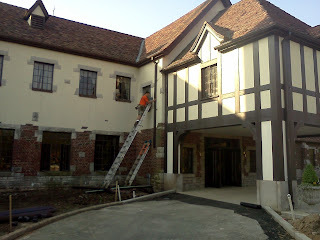 The new handrails being installed near the casual entrance. Yes, they will be painted a different color. That is the primer that they are painted with now. Carts on Fairway/Long range grass tee open! Before the big rain arrives this evening into Thursday, we are allowing carts on Fairways and the Long Range grass tee is open. 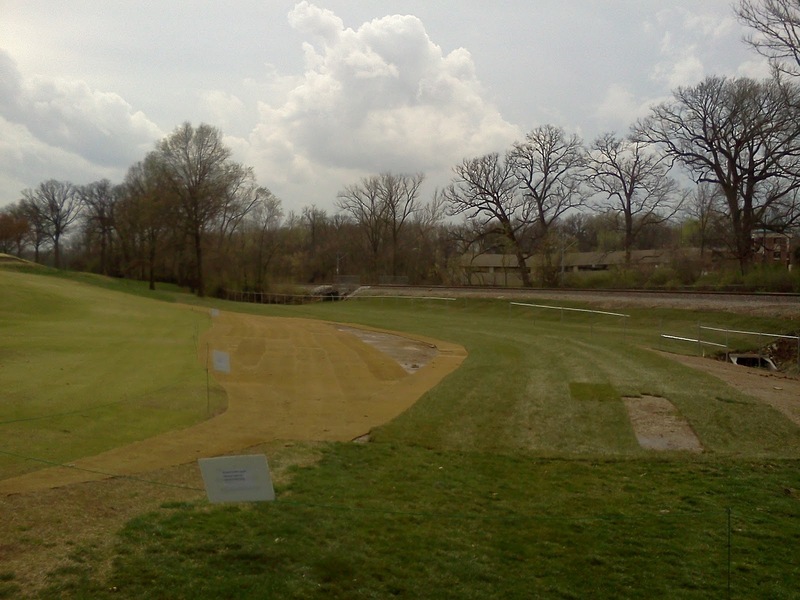 The Long range grass tee will be open on Wednesday, Friday-Sunday when conditions are dry enough for use. Tuesday and Thursday all weather mat tees only. 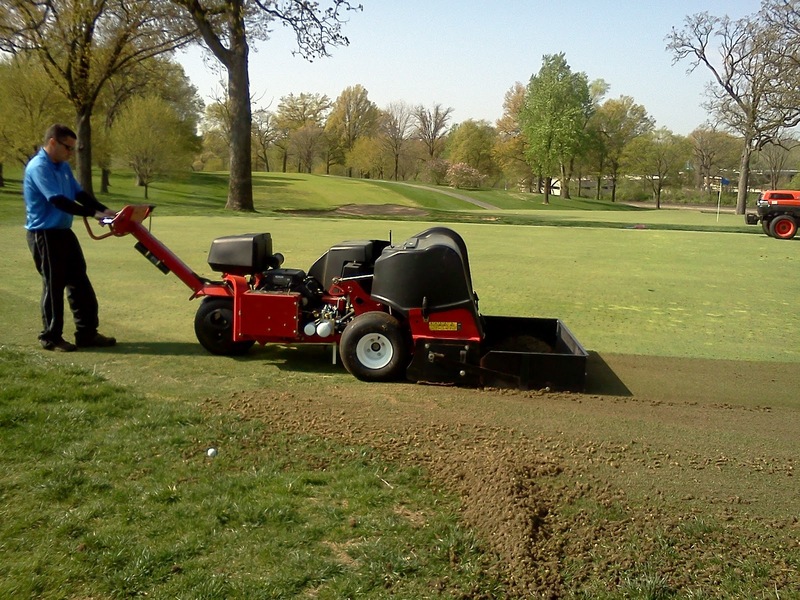 We must reduce the use of the grass tees during the season because the tee is not large enough to handle six day a week use and have grass during the full season. 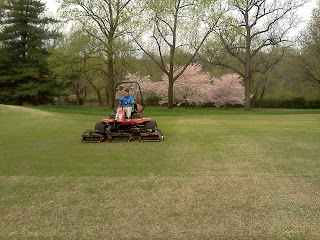 Tom mowing in front of the green of #2. The beautiful cherry trees blooming in the background. Just checked the site and saw it was empty. Heart sunk. Read twitter feeds. One egg was not viable and did not hatch. Second hatched but did not survive. If you have been following this nest, you can go to another site in Iowa that has 3 eggs on the nest. Decorah, Iowa eagles. The weather has really been beautiful over the last couple of weeks but it has created tremendous timing issues for our staff. Normally we have 2-4 weeks to get various weed killing and pre-emergent products applied to our turf areas but the drastic increase in air temperatures, particularly night time temperatures have raised soil temperatures quickly. These products need to be applied now. Now as in yesterday and the day before. We will be working diligently over the next week to get our products applied before germination of crabgrass occurs. 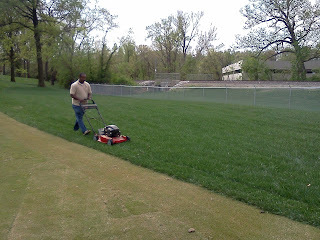 Also, grass is beginning to grow and we had our rough mower out this week trying to get some of the close areas mowed. We will increase our efforts to get things cleaned up over this next week. The fairways are greening up nicely but are still very soft. I am still concerned regarding frost but the long range forecast is still showing above normal temperatures for the next two weeks. We are adding another staff member this week and will be adding 2 more around April 2nd. Our final two staff members graduate from High School at the first of May which will be our final two employees for the season. Greens aeration is planned for Sunday evening, Monday and Tuesday. We plan to double aerate with a coring machine and then plan to do a large solid tine. Holes will be filled as normal to help with recovery. I expect greens to be in good condition for opening day on April 14th. 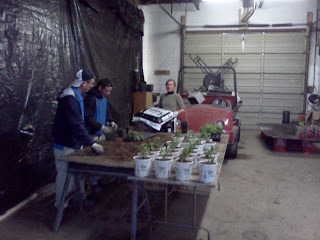 Multiple shipments of new plants that Becky ordered for this season arrived last week. Becky and a couple staff members planted one day and Becky had a couple of days of planting on her own. She has also been busy planning the changes to the ornamental beds for the newly remodeled clubhouse area and working with vendors to get these plants shipped in for the end of the month planting. She has also been busy cleaning and sprucing up our existing beds around the property. She is definitely a great asset for our operation. Becky, Tom and Jeff getting the first plants of the season placed in pots. 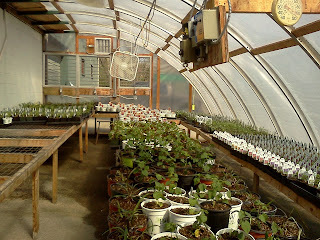 The greenhouse well over half full of plants. Our staff installed drains in the #1 area late last week and finished graded the area in preparation of sod which was laid on Thursday of this week. 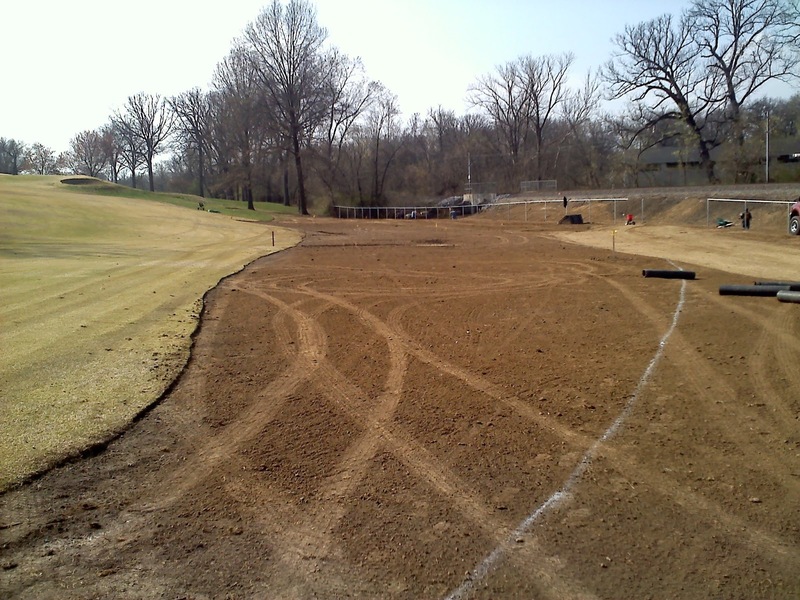 The contractor laid almost 3300 yards of fescue sod and about 520 yards of zoysia. 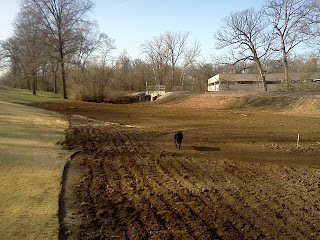 I was a little short in my estimate on the zoysia which is why there is a small area not filled completely. We expect if the sod fields dry and our area dries that the remaining sod will be laid later next week. 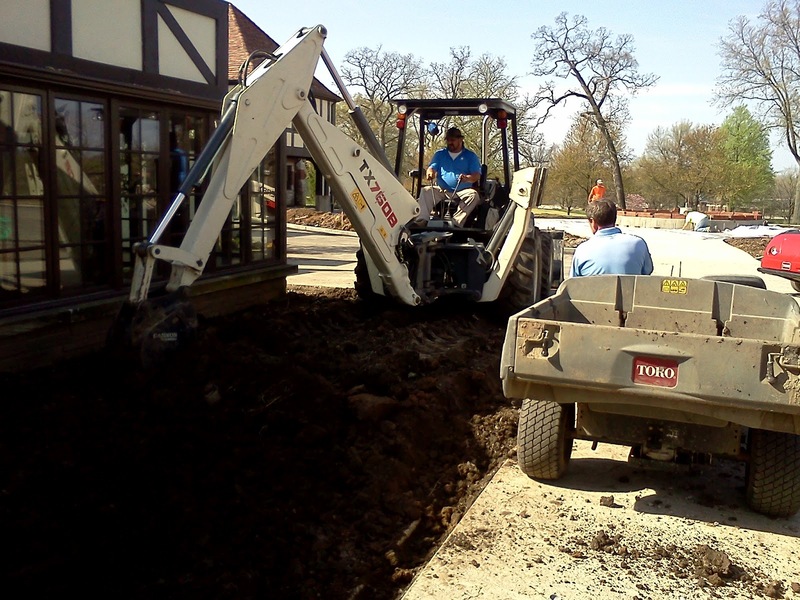 This area will be roped off and is closed to golf until the sold fully roots and can handle foot traffic. 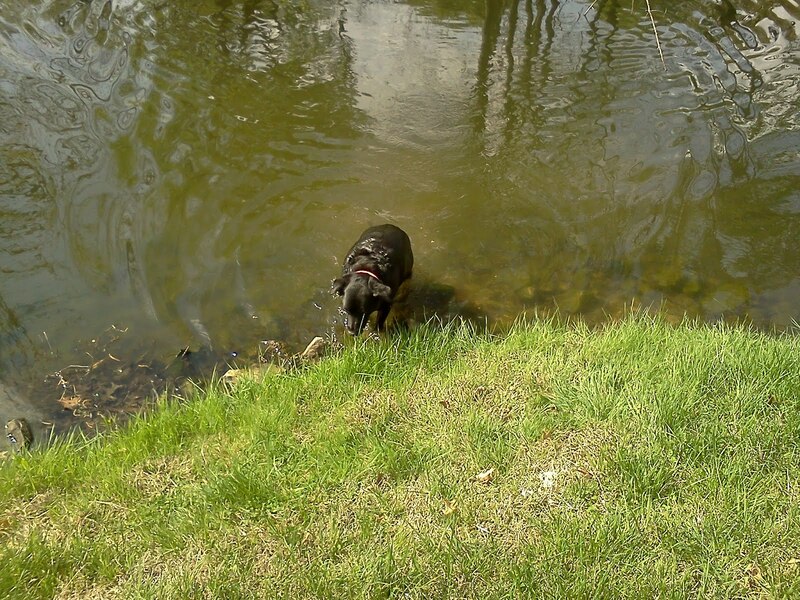 Be very careful in retrieving golf balls because the area could be extra soft. 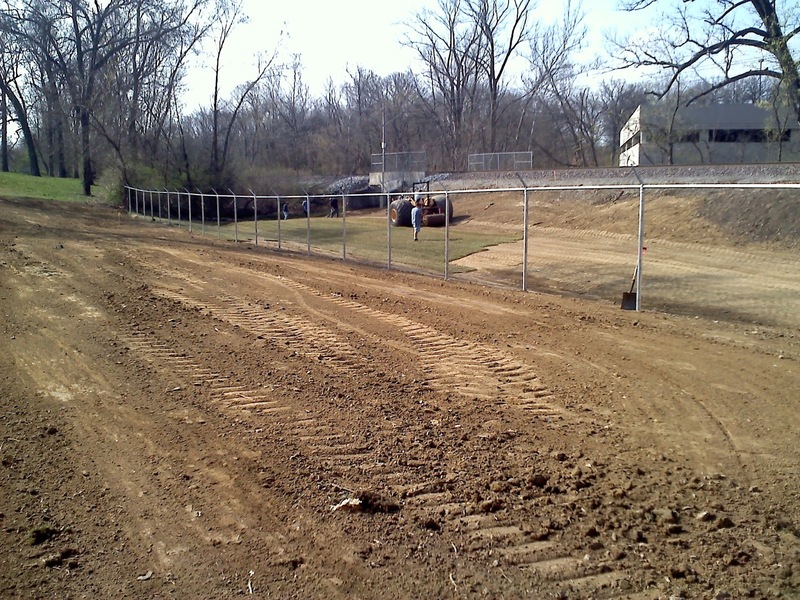 The fencing contractor was in and set posts on #1. 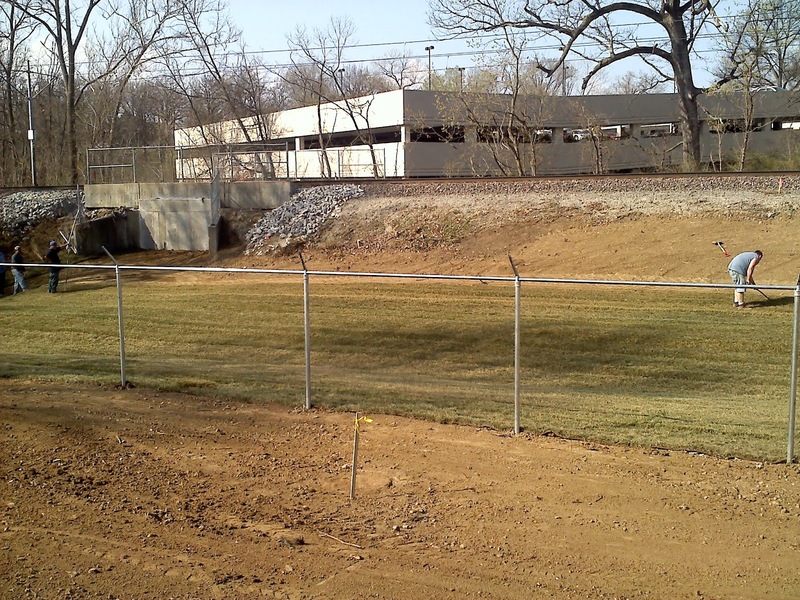 We requested of metro that they place a fence in the area that was cleared along the length of the buried box culvert that was placed between the tracks and the driving range. The mesh should be installed on #1 early this coming week.Asphalt repairs were completed in our maintenance area and road. 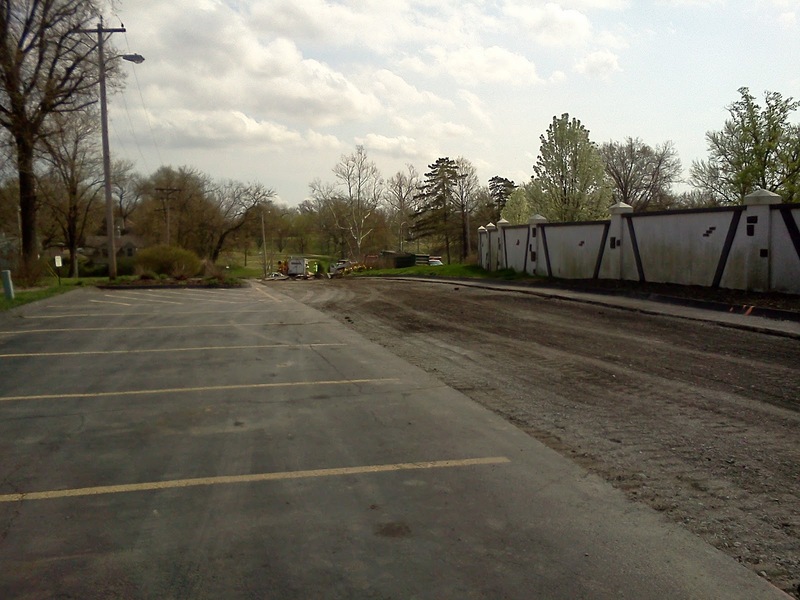 The back gate area will be closed on Monday and Tuesday in preparation of new asphalt being applied over the area that was damaged by construction traffic. 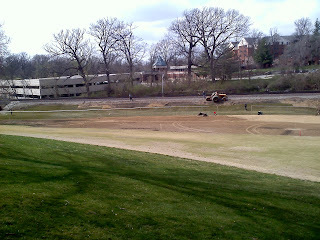 The staff stripped of the sod that was left on the mounds as well as into the fairway. 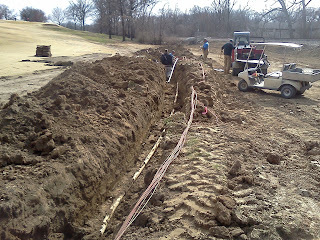 Irrigation lines rose up into the old mounds. 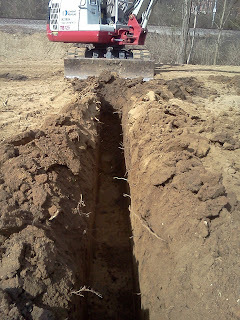 The line was exposed and then lowered into a deeper trench. Staff replacing a head that was originally removed. Tom assisting Skip with drain line installation. This work was completed on Friday/Saturday of last week. Staff connecting the lines into the 18" catch basin. A view from the cart path with outflow pipe being prepared to be dropped in the trench. Jeff and Skip adding some sand to help bridge the pea gravel from contamination. 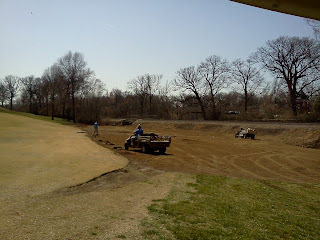 Skip beginning to finish grade the area in preparation of sod. Lady checking out the area to make sure Skip has everything under control. 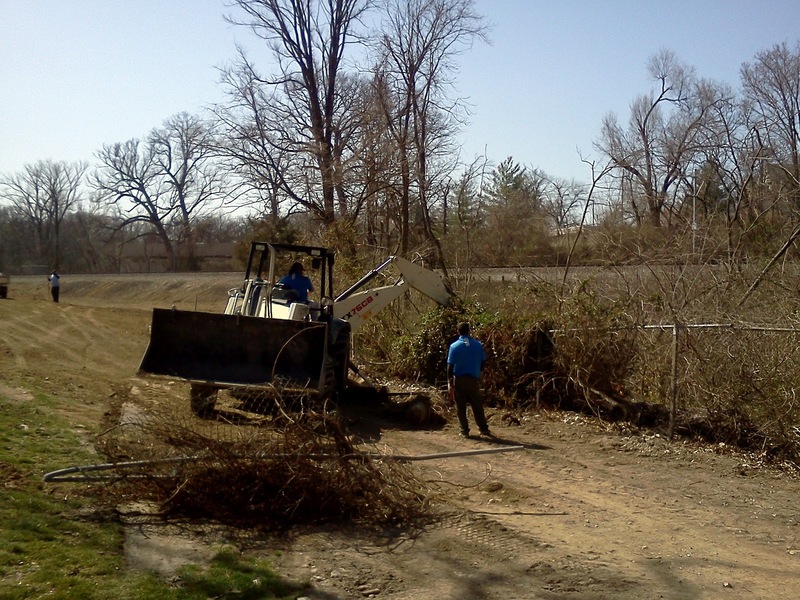 Skip and Tom ripping out an additional 150 feet of fence which metro agreed to replace. Some of this fence was destroyed by a large oak last summer. Staff doing some final touch ups in preparation for sod. 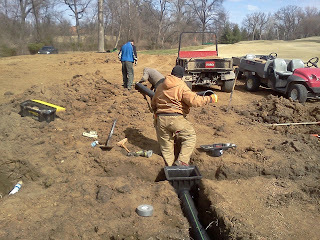 Fence contractor drilling fence post holes. 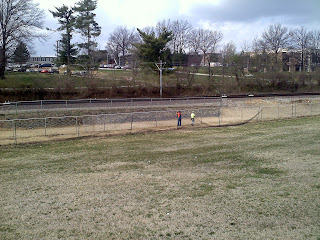 Contractor installing fence at bottom of swale on the long range. 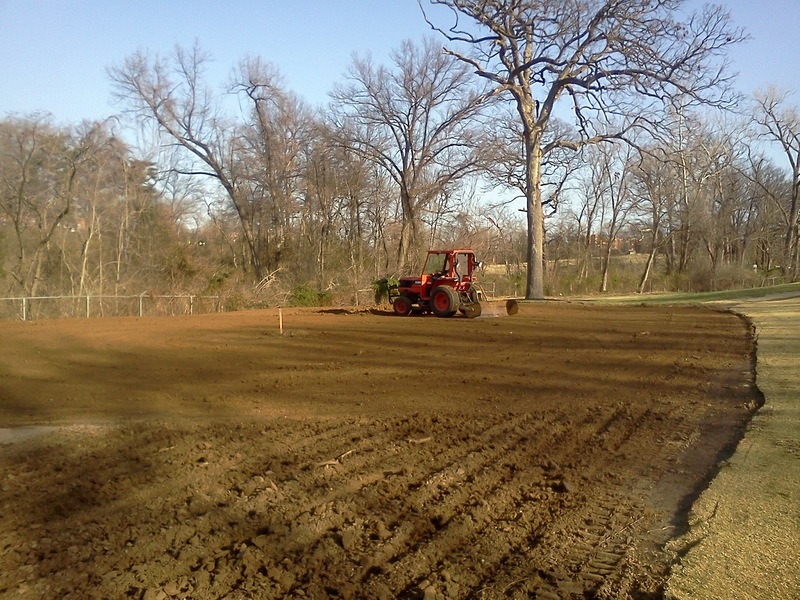 Missouri Turf Company laying sod. Sod being laid along metro tracks. 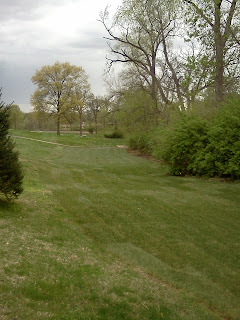 White line designates new intermediate line to the left which will tie into the expanded fairway. 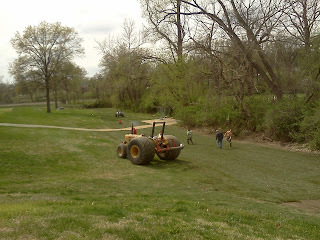 Tractor picking up big rolls of sod. 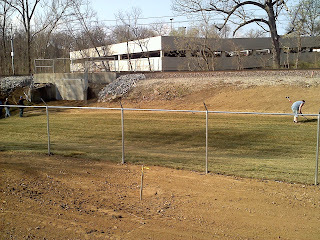 Laying sod near metro tracks. A view from the cart path. A majority of the turn area with new sod. 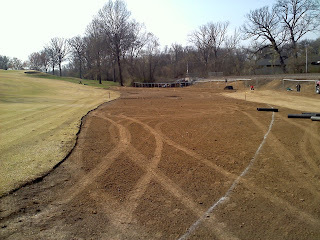 We were short about 50 yards of zoysia and still have the corner to sod in fescue and the remaining construction road.